From injecting earlobes for good luck to training other physicians, Singaporean Physician, Dr. Ang has a number of interesting stories to share. Dr Steven Ang started his private cosmetic medicine practice in Singapore in 1998. The same year, he became a member of the International Union of Esthetic Medicine, and in the process, introduced the term and concept of esthetic medicine (cosmetic medicine) locally. He was one of the pioneer cosmetic doctors in laser medicine and surgery, intense pulsed light, botulinum toxin and dermal filler injections in Singapore. In the past, he had been a trainer in botulinum toxin injections. He had developed the course syllabus at a local beauty school. He was a member of the Beauty Task Force, a committee set up by the Consumers Association of Singapore to look into objectionable practices by beauty salons and consumer complaints in Singapore in 2002. Which factors played in your journey to cosmetic medicine? I was exposed to using lasers for skin treatment in 1991 while working at a clinic. In the process, I saw a big market potential for cosmetic medicine. As a teenager, I suffered from severe acne. One of the nasty remarks made by a former classmate that stuck in my mind was: “Your face looked like excreta.” Later, I managed to treat myself and regain confidence. This motivated me to want to help others. My favorite tagline is “Sculpting Beauty, Creating Happiness”. I graduated with Bachelor of Medicine and Surgery degrees from the National University of Singapore in 1987. I sought further training at the renowned St John’s Institute of Dermatology in London and obtained my Master of Science degree in Clinical Dermatology from the University of London in 1994. In the early days, there was no formal training for cosmetic medicine. I enrolled at a local beauty college that offered diplomas from the United Kingdom and Switzerland. I learnt the practices of an esthetician. In 1998, I became a member of the International Union of Esthetic Medicine (IUEM), which was based in Europe. I started my private cosmetic medicine practice in Singapore in 1998, and through my membership with IUEM, introduced the term and concept of esthetic medicine locally. Slimming and body contouring are another aspect to cosmetic medicine. To learn more, I undertook the clinical and oral examinations conducted by the American Board of Barriatric Medicine (now renamed as the American Board of Obesity Medicine) in 2002. I now practiced at two locations, in Orchard Road and Redhill. We offer a full range of esthetic services. Our staff strength is 13 personnel. We serve thousands of patients each year. Can you tell us how you handle staff and their work? In staff recruitment, I believe in paying salaries that are above the market rates. That way, you can attract better personnel. In Singapore, because of the strict regulation governing payment of commissions to staff, I pay bonuses instead, which are based on staff performances. To incentivize staffs further, I worked with a renowned botulinum and dermal filler company recently to sponsor treatments of my staffs. We are in the process of producing a coffee-table book to showcase the before and after treatment photographs of the staffs. This makes the staffs happy. They are also walking advertisements to attract customers. With the many laser technologies available in the market, which ones do you have in your clinic? I have a wide array of lasers, radiofrequency and related devices to treat all sorts of cosmetic conditions. I also perform botulinum toxin and dermal filler injections, and thread lifts. In making any equipment purchases, I am guided by evidence-based medicine. As cosmetic doctors, we are all afraid of buying “white elephants” and most keen on buying “work horses”. There are three things I’ll do. First, if possible, I’ll check with friends from other countries who have bought and used the machine. It is inevitable that in a local community, partly because of competition and partly because of loss of face issue, no doctor would want to admit he has bought a dud. Second, I have a “no try, no buy” policy. Third, I look towards websites like medicalspamd and realself for information and feedback about the machines and treatments. I like machines on a single platform that can treat a variety of conditions. For example, I have a Cutera long pulsed Nd:Yag laser that can perform skin rejuvenation, hair removal and vein treatment. I have a Norseld Dual Yellow laser that can treat conditions ranging from acne to melasma to seborrheic keratosis. I have a ThermiRF machine, which utilizes radiofrequency to treat conditions like double chins, fine eye wrinkles and frown lines caused by overactive muscles. How do you advertise your clinic to patients? In terms of marketing efforts, we use both new and old media to reach out to patients. As a result of our long history of practice, we attract many new patients by “word of mouth”. We also place advertisements in the newspapers and magazines. In recent years, we have used Facebook as a means to reach out to patients. Whatever the media we use, we send a consistent message. We used my name, Steven, as an acronym to portray our values: S for safe and proven treatments, T for technically skillful, E for excellent service, V for value for money, E for expert and honest assessment, and N for novel and at the forefront of beauty care. What are your most profitable procedures? One important source of our income is from botulinum toxin and dermal filler injections. We have become one of top users in Singapore for a renowned brand. Over the years, I performed decreasing numbers of chemical peeling and IPL treatments. Many patients view these treatments as passé and are not interested. In Asia, we have a big problem with pigmentation disorders like melasma. I am currently looking into the feasibility of purchasing a picosecond Nd: Yag laser to treat pigmentation disorders. What stories can you share with us? One thing I learnt about practicing cosmetic medicine is unpredictable situations can arise and you must learn to respond. Once, I have a Chinese patient who consulted about getting dermal filler in his earlobes. According to him, a bigger earlobe will attract fortune and ensure a long life. Being Chinese myself, I know that these ethnic physiognomy beliefs are real. Therefore I proceeded to treat him. As an experienced physician, what can you advise your fellow doctors in cosmetic medicine? Over the years, I have learned that there are several critical factors that can contribute to the success of a practice. First, I not only hear, but also listen very carefully to the concerns of my patients and what they want. Cosmetic medicine is slightly different from other branches of Medicine in that the doctor does not always know best. Beauty is in the eye of the beholder. At the end of the day, the patient must be happy with the treatment. For example, if a patient comes to me for dermal filler for her nasolabial folds, I will usually comply with her wishes. However, I won’t perform the injection without informing her that she would look very much better if her midface is also treated, as this is the source of her problem that contributes to her prominent nasolabial folds. Often, I find that she can be quite receptive to the idea, after I’ve agreed to treat her folds first. If I had insisted from the outset that she has her midface treated first without treating the nasolabial folds, she will probably be unhappy even if the outcome of treatment is good. Second, I always consider every treatment as my Last Chance with the patient. So, I will be extremely attentive and perform every procedure to the best of my ability. When I say Last Chance, I mean there are so many ways that patients can be displeased with my services and stop using my services in the future. It could range from poor greetings from the receptionist, to the patient’s perception that I have not listened and considered her concerns. So, I try to get it right the first time and every time. Third, to me, explaining a procedure to patients is more important than performing the procedure itself. During the process, I can manage the expectations of the patient, point out certain existing facial features that the patient may not be aware of that she may later blame on the treatment and highlight the benefits and potential risks. Fourth, I will always try not to get agitated and disagree with a patient when she gives negative feedback about the treatment outcome. I’m sure many doctors have experienced patient encounters when the treatment outcome is good, but the patients are hardly appreciative. I try to understand their motives. Some may have expected a greater outcome than what is technically feasible. Others may be angling for discounts, free products or free services. I have listened to Dr Jonathan Sykes MD, a prominent facial plastic surgeon speak about similar experiences. I find my approach similar to his. I will listen and commiserate with the patient, and then ask her later for permission to show her photographs before and after the treatment. Most patients will eventually realize that the results are actually much better that what they complain about. Dr. Ang was a trainer in Botulinum injections for Singapore doctors. He also trained beauticians and estheticians at the Top to Toe College of Beauty, helping to develop the course syllabus in early 1995. 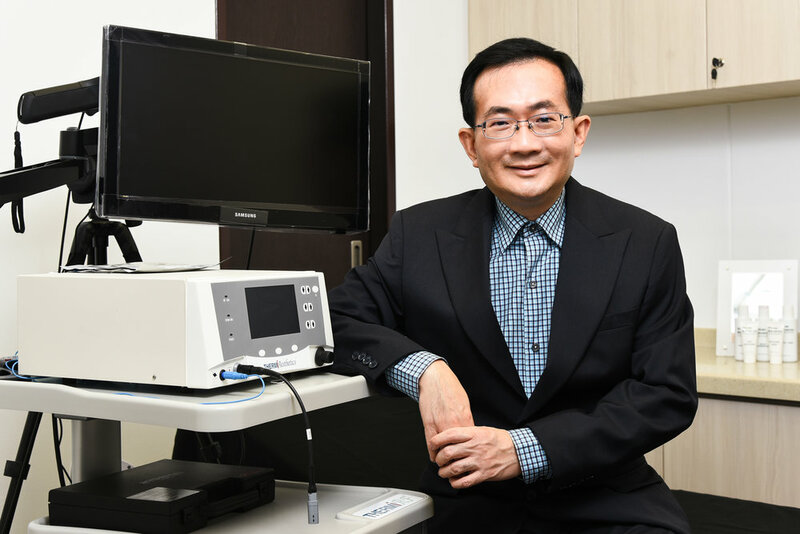 Dr. Ang had worked in the top management of various hospitals, including Singapore General Hospital, Changi General Hospital, National Cancer Centre and the now defunct Toa Payoh Hospital. He was the Chairman of the Healthy Lifestyle Committee at Toa Payoh Hospital and Changi General Hospital.